Lunch Time Learning: To Fast or Not to Fast, How is the Question. Fasting is, by far, the least-appreciated and least-practiced spiritual discipline. There is a curious apathy about a discipline Jesus assumed his followers would practice. 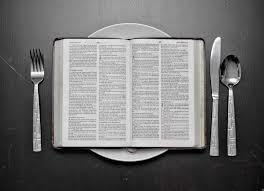 After all, just as he gave instruction on prayer prefaced by the words “And when [not if] you pray…,” he gave instruction on fasting prefaced by “And when you fast…” Both appear to be normal, expected disciplines for Christ’s followers. While Jesus did not command fasting, certainly he commended and demonstrated it. At the very least, if Jesus felt it necessary to fast, it seems unlikely that we are meant to avoid it altogether. I am convinced that much of our apathy toward fasting derives from our confusion about it. We do not understand why or how to fast and, therefore, we do not fast. Strangely, we seem to want to have a perfect theology of fasting before we practice it. Yet nowhere else do we demand such precision. We begin to pray before we know an adoration from a supplication and we begin to read the Bible before we know an epistle from an apostle. But somehow when it comes to fasting we allow ignorance to breed inaction. At heart, fasting is simple—it is refraining from a specific thing for a specific time and a specific reason. Fasting is refraining from food. Lately, I have heard people advocating refraining from other things in place of food, especially during Lent. “I am fasting from Facebook this year,” a friend told me. But biblically, we are to fast from food for this simple reason: Food is something we need, not merely something we want. You may want to use Facebook, but you need to eat food. Thus, in fasting you are withholding from yourself something you need (food) in order to pursue something you need even more (communion with God). Fasting is for a specified period of time. You can fast for a morning, you can fast for a day, you can fast from sunup to sundown, you can fast for a week, or you can fast for a morning every day of a week. Fasting must only be long enough to feel it physically, to feel the weakness and hunger pangs that remind you of your weakness and your utter dependence upon God. Fasting is for the purpose of prayer. Fasting is related to prayer in such a way that one theologian describes them as “first cousins.” We are to fill our whole lives with prayer so that we pray continually about every kind of issue (1 Thessalonians 5:17; Ephesians 6:18). We are to unrelentingly bombard heaven with our prayers (Luke 18:1-8). Yet at times we are also to fast, and it seems from the biblical record that fasting is related to prayers that are especially earnest and intense or that come at times of deep spiritual sorrow, desire, or uncertainty. It may not be necessary to fast over your prayers for God to help you plan vacation well or to heal your sore knee, but it may be wise to fast over your prayers that God would help you overcome your addiction to alcohol or your pleas that God would grant salvation to your wayward child. Thus, fasting is something you can add to prayer. You fast in those times you earnestly desire to seek God, the presence of God, the will of God, the power of God, and the forgiveness of God. If it is worth pleading with God about it, it’s worth fasting about it. Ultimately, prayer is a means of seeking God himself, and fasting is God’s mysterious but effective means of assisting that noble desire. It is putting aside the satisfaction of food to come to a deeper satisfaction in God. It is diverting the desire for food into a desire for God. Through it all, remember that God is for you. He is a loving Father who is far more concerned with the orientation of your heart than with your first hesitant actions. You do not need to master a theology of fasting before you begin to practice fasting any more than you need to master a theology of worship before you begin to worship. Ultimately, fasting is the school of fasting just as prayer is the school of prayer. Learn to fast by fasting.